Bouras and her league mates skated down the middle of the road, taking advantage of the open asphalt expanse, which roller skaters say is hard to find. “We can’t skate just anywhere,” said Tovah Abrams of Portland. The Maine Roller Derby members were among hundreds of people who braved scattered showers to cavort in the automobile-free zone. “It’s been nice not to hear the cars,” said Kat Rothe of Portland, who was walking the Back Cove with her friend, Liz Harlow of Livermore. The idea for closing the boulevard to motorized traffic grew out of a public works sewer project last year to improve water quality in Back Cove, a 3.5-mile round estuary basin. City officials expected complaints from motorists and local residents when the boulevard was shut down for eight months. But the traffic jams never materialized and people took to the street to socialize and recreate, joining the throngs who already used the walking trail that encircles the cove. Portland joins a growing number of cities that temporarily shut down streets to automobiles in favor of walkers, skateboarders and dancers. They include Cambridge, Massachusetts, which has closed a section of Memorial Drive along the Charles River on summer Sundays for years. 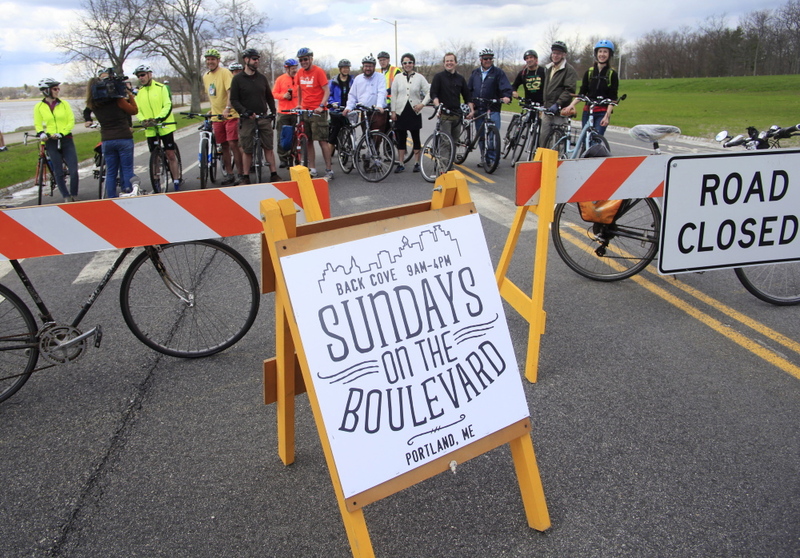 On Sunday in Portland, a pack of city officials and pedestrian advocates marked the first Sundays on the Boulevard with a 6.5-mile bike ride from Munjoy Hill through Deering Oaks and onto Baxter Boulevard. Along the way, they inspected the condition of the city’s bikeways. “We wanted to create an opportunity to share the good and the bad,” said Jennifer Claster, past chair of the Portland Bicycle and Pedestrian Advisory Committee. Peter Schaffer of Portland brought up the rear of his family group, pushing his son Nathaniel, 15 months, in a stroller while his wife, Heather, ran after 5-year-old son Maximilian, who pedaled his bike wildly down the middle of the boulevard. “This is a huge asset,” Schaffer said. Andrea Conley of Portland, her husband, Patrick, and their daughters Maddie, 5, and Rowan, 1, also took to the street. They said they were having so much fun, they planned to come back again. “We are thinking of bringing a picnic and making this our regular Sunday activity,” Andrea Conley said.